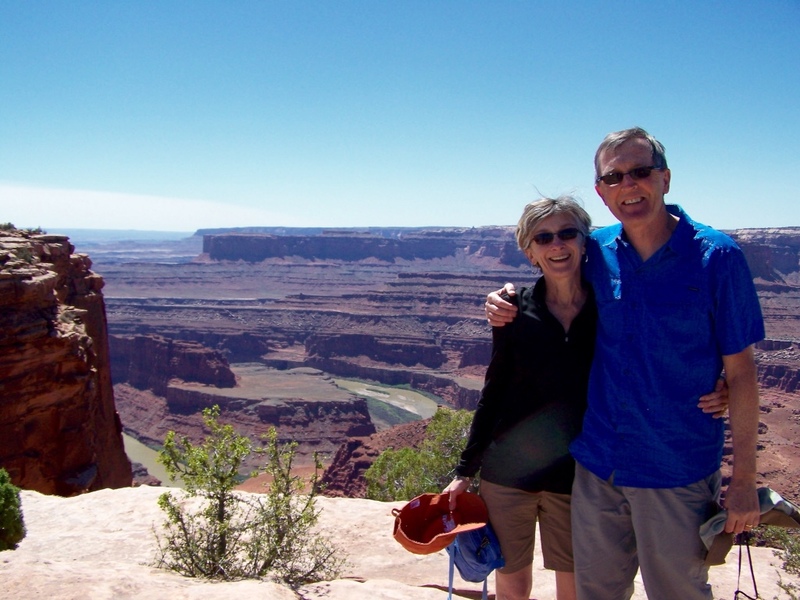 We arrived in Moab, Utah yesterday, after a hair-raising drive across the snowy mountain passes of Colorado. Our trip has been pretty low key so far. We've seen a lot and done a lot, but evenings have been quiet and relaxing. Moab attracts a different crowd than we've previously seen. We had no idea this was such a Mecca for the 4-wheel off-roading crowd! Sidewalks and restaurants are teeming with people; both young and old. Jeeps and Hummers rule the roads, roaring through town to hit the trails. This morning we went in search of peace and quiet. We found it at Dead Horse Point State Park. 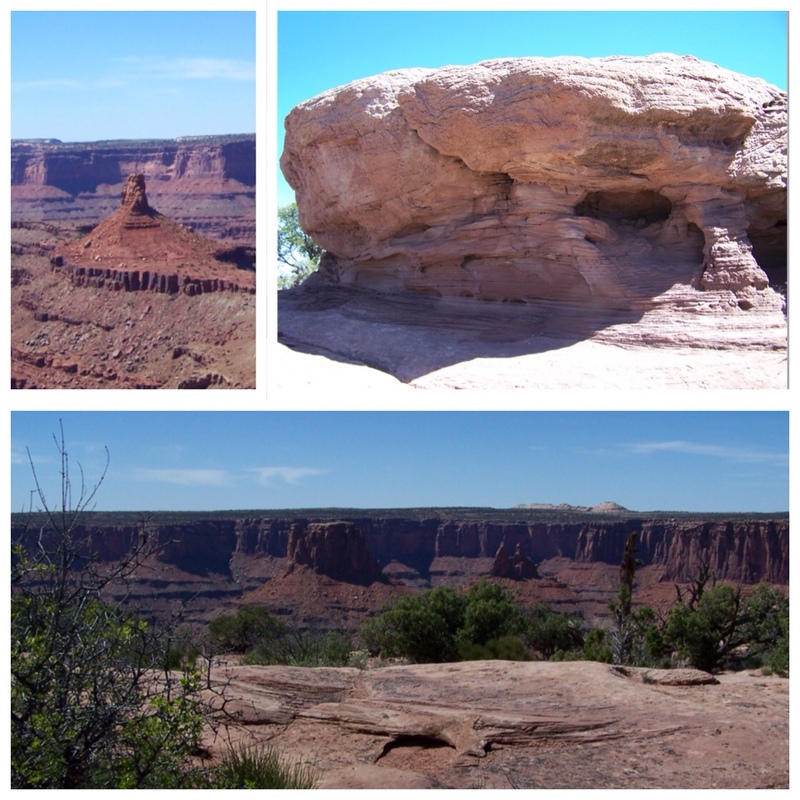 Just 30 miles northwest of Moab, this lesser known park provides some pretty spectacular views. We stood 5900 feet above sea level and 2,000 feet above the Colorado River, in awe of the skills possessed by Mother Nature. She is, without a doubt, the world's finest architect. 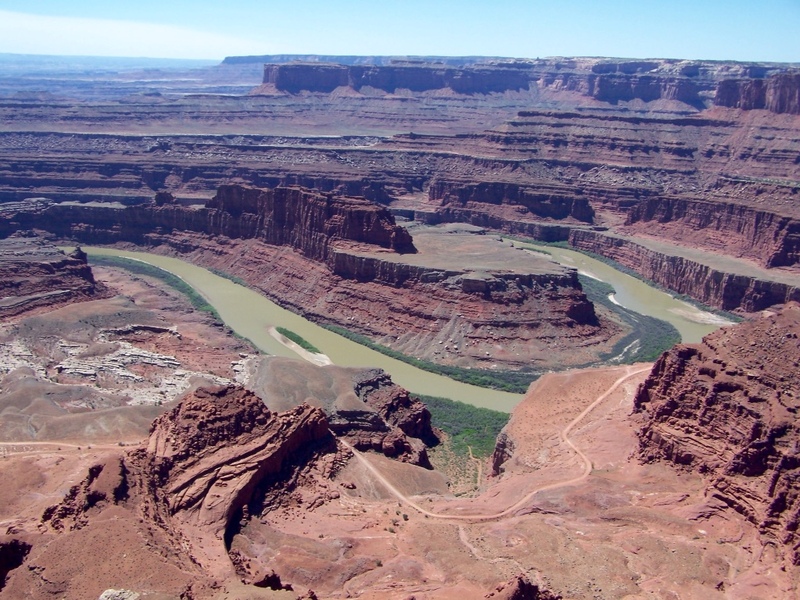 The Colorado River snakes its way through the canyon floor below Dead Horse Point. Fascinating and colorful rock formation could be seen near and far. Rather than drive from view point to view point, we chose to walk the East and West Rim trails. Halfway along the four-mile route we arrived at Dead Horse Point. How did this park get its unusual name? Legend has it that the point was at one time used to corral wild mustangs. The neck of the point is just 30 yards wide and cowboys were able to block off a natural corral to hold the horses. Once corralled, cowboys were able to choose their favorite horses from the wild herd. Sadly, an unhappy fate awaited the leftover mustangs. They remained trapped on the point where they died of thirst…within view of the Colorado River but unable to reach it. Yes, it is an amazing spot. Thanks for visiting carryoncouple. What a wonderful road trip! Thanks for the note! You must be getting close to your trip, eh? Cant figure out who the filmstars are!!! Do you fancy a trip to vancouver for a day at the beginning of september?!!!!!! Vancouver? September?? What is this all about?? ?